There are many ways for those of us who give gifts at Christmas to bless both the receiver and the one from whom we obtained the gift! Worthy causes exist all around us because of the broken world we live in. This Christmas, why not give strategically to benefit as many recipients as you can? Decide early on (now would actually be good!) to purchase your gifts from local charity stores. My little community has thrift stores which benefit a wide range of agencies and organizations – Animal Friends, Humane Society, a local women’s shelter, the Salvation Army, Disabled American Veterans, support and education for families affected by autism... Do your homework and decide which cause will benefit from your Christmas shopping this season! Best to start with a list of people rather than a list of items that you want to buy, then let things surprise you as you search for treasures. It may take multiple visits to the same shops for the right gifts to surface – be patient (but know that the selection changes often and unpredictably as donations are received). Combine theme-shopping with support of a cause for a way to give gifts with stories behind them. Search for things like funny t-shirts, jewelry boxes, antique mirrors, favorite book titles, mugs (to give with homemade drink mix) or glassware (to give with a bottle of your favorite wine). Don’t underestimate the potential of thrift and charity stores to contain really nice, comparable-to-retail gifts! I’ve often found brand new appliances and clothing with store tags still attached, along with some well-preserved and very unique glassware and jewelry. I have a friend whose family has taken this kind of system to a new and charitable level! Everyone’s name goes into the hat, but only one name comes out. A dollar amount is decided upon, and everyone gives their money to the lucky winner! 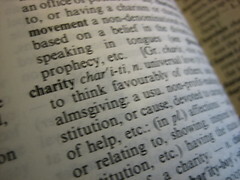 This person is empowered to select a charity organization on behalf of the family. He or she does their homework and chooses a cause that matters to them personally. Whether the organization receives the money, or the money is used to buy items needed by the chosen cause, is up to the designated family member to decide. On Christmas morning, the adults in the family open a single wrapped gift which reveals the details of their family gift transaction! Some retail chain stores have product lines that support specific charitable efforts of their organization. Kohls Cares products support causes like kids’ health and education and breast cancer research, with a nice variety of inexpensive items offered online. Holiday bazaars are offered at churches and in communities everywhere before Christmas – why not work to plan an event where each vendor sells products that support worthwhile causes? Invite organizations like the ones above to showcase their giftable items, but also encourage those who craft and create locally to donate items whose sales price (or a portion thereof) will be given to a cause. The details are up to you, but I’m certain that shoppers would support your charitable efforts! Imagine the difference you could make around the world simply by choosing to give for a cause this Christmas! Today we continue to explore alternatives to market-driven gifting from the perspective of collections, with a special emphasis on gifts that connect you to your recipients and your recipients to one another. Several years ago my mother-in-law, who has quite the Precious Moments figurine collection, decided to gift her collection to the family. Gathered in her home, she asked every grandchild, child and spouse to choose a figurine that meant something to us. This was our piece of her – and our memories of time spent in her home – what a wonderful gift! Each of us took home a memory, but also a connection to one another. Those figurines now sit on shelves across the country – a daily reminder of Grandma, her faith, and our family. Perhaps you have such a collection – something that has outlived it’s shelf-life or outgrown its space in your home. Something that others connect with thoughts of you. Something that would mean the world to those who have grown up around those shelves. Maybe this is the perfect year to gift out your collection – and foster new connections among the ones you love! The same idea can be harnessed for those who don’t have personal collections… Create one! Take an item – something you like, something that tells others about you, something funny – and create a collection from which to give! Crazy Socks – start a collection of silly socks as you find them on sale or online. Give each person on your list a pair that reminds you of them! Hats – I did this one year with stocking hats – for my nephews. Each one received a different goofy hat – some were animals, others were woven in loud colors or wild designs. Start early in order to have the opportunity to buy on sale or in bulk! Crosses – I have a wall full of crosses in my home. Each one has been gifted to me by someone special, with a unique story to go along with it. 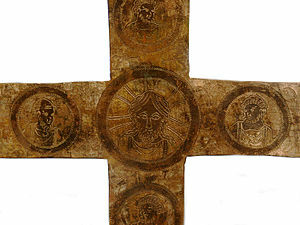 I’m definitely not looking to re-home my own crosses, but because I value my collection, I could spend the next six months finding uniquely crafted crosses to give as gifts in December. Recipients would know the connection if they’ve been as far as my front door, and they would also be connected to each other by receiving such a gift from me. Any type of item would work as a gifting collection: picture frames, jewelry boxes, salt shakers, sand castles, a particular color of glassware, seashells… Simply make the connection to who you are and what you love! One year my sister gave original framed art gifts to everyone in the family. Each was hand-painted by my nephew (who was 4 or 5 at the time), numbered like an art collection, and framed. This could easily work with a single picture, photo, painting or sketch as well – simply number the prints and frame them! Consider enclosing a card that pictures each print given, so that you can share the entire gallery with every recipient. Giving from your own library is another way to pass along memories to those whom you love! If your family is spending the holiday with you, consider inviting each to choose a book that would be meaningful to them from your collection. If you have a favorite title, begin scouring book and thrift stores (and amazon.com) for enough copies of that title to share with everyone on your list! Favorite author? Select a book for each recipient from his/her list of titles. Some of the most enjoyable gifting experiences stem from the events you’ve lived.If you had a funny or meaningful thing happen to you this year, is there an object connected to the story? Look for ways to give that also share that story with others. Start early – especially when collecting harder to find items. Give the gift – share the gallery! Include a photo of the entire collection so your recipients will see how what you have given also connects them to others. Buy in bulk – especially with books! If you plan to give many of a single title, shop around for case discounts online. Shop off-season! You will find great deals if you wait until the end of the season to stock up. Write out the story that connects your gift to you! Include a copy with the gift, even if you plan to tell the story in person. A Google search for funny sayings, greeting card humor or humorous quotes will produce a plethora of giggle-producing words for the folks you celebrate with (you can even search by specific types of humor: golf humor, computer humor, teacher jokes, animal jokes, etc.). If you land on one saying or verse or joke that makes you laugh tears, consider using it as your theme; gifting something to each recipient on your list with your chosen humor as the highlight. Or, you might enjoy personalizing the words you choose for each recipient instead, in which case you could give the same type of gift but with a different saying on each. Frame it! Use computer graphics, embroidery, cross-stitch or even a photograph to create a frameable version of your words. One way to make this a family project would be to write out the words (boldly) on posterboard and then photograph your children, grandchildren or yourself holding the board. You might even enlist your family to act out the saying or joke in a photo and surround it by a matboard where the words have been written or mounted below. Purchase frames from your local craft or dollar store and dress them up to suit your recipients. Knock Knock Jokes! Woodworkers might enjoy creating 8×10 doors with a drawer-pull for a knob, and writing or painting (or even decoupaging) a Knock Knock joke onto each. This would make a fun gift for families to create together – let the kids help choose the jokes! Magnetic Words! Buy magnets or sheets of magnetic craft paper (with peel-off sticky surface) and make your humor refrigerator-ready. This option is great for people who enjoy creating on the computer. Environmentally or Socially Conscientious? Secondhand, thrift and consignment stores hold untold treasures for those who are choosy about how they shop (and have the time to hunt and explore). With six months to go until Christmas, you could have an obscene amount of fun searching for plaques, t-shirts or mugs with funny sayings to suit everyone on your gifting list! This theming idea is rich with memory-making potential, since each piece will have a story of its own to be shared as your gifts are opened. Stuff your funny finds into a basket or hand-decorated smiley face bag! Calendars! Enlist your children’s help in creating joke-of-the-month calendars to share! These could even be handwritten and signed by the contributing child so all recipients can connect with the monthly humorist. Maybe even put a photo of that month’s contributor – smiling or laughing, of course – on the page with the joke. Have an idea to share? Use the reply option below!